Deputy Chief Preston P. Horton joined the MBTA Transit Police Department in 1998 after serving as a police officer for the City of Northampton. He was first assigned to patrolling the red line in Dorchester where he now resides. Other assignments included the Anti-Crime Unit, Field Training Officer and a member of the Transit Police Honor Guard. 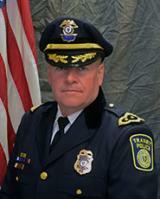 In 2004, Deputy Chief Horton was assigned to the Court Case Management Unit until promoted to Sergeant in 2005. At that time, Deputy Chief Horton commanded the Honor Guard, and became the department’s supervising officer of the Field Training Program for all new MBTA Transit Officers. From 2005 until 2012, Deputy Chief Horton was a patrol supervisor in TPSA 1 and TPSA 3. In 2012, Deputy Chief Horton was re-assigned to the Special Crimes Unit until his promotion to Deputy Chief in April 2015. Deputy Chief Horton holds an Associates Degree from Holyoke Community College and a Bachelors Degree from Western New England College.